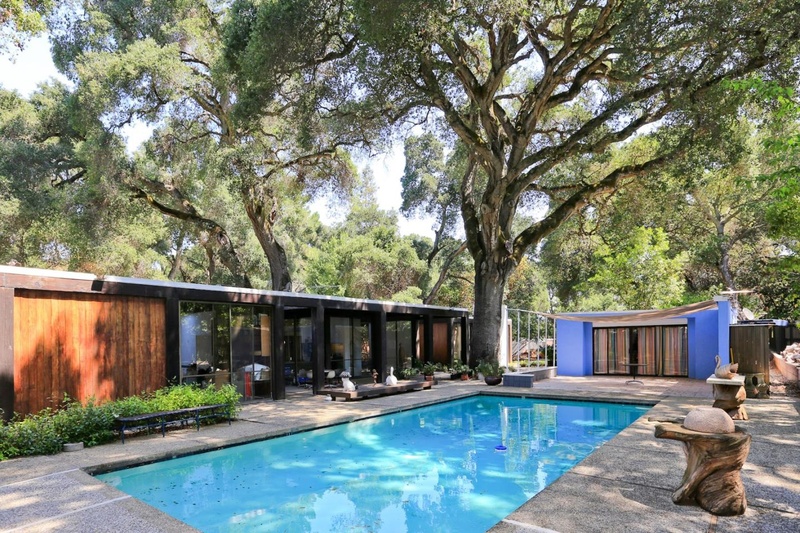 From the moment you see the front doors on this Woodside, CA, home (which was sold in August for $7.4 million), it’s clear they are pieces of art that transcend the simple act of entering or exiting. Hand-painted in geometric shapes and vibrant hues of red, blue, and white, the eye-popping visual jumps from the modernist wood-and-glass structure that otherwise blends into the natural surroundings of the woodsy lot. 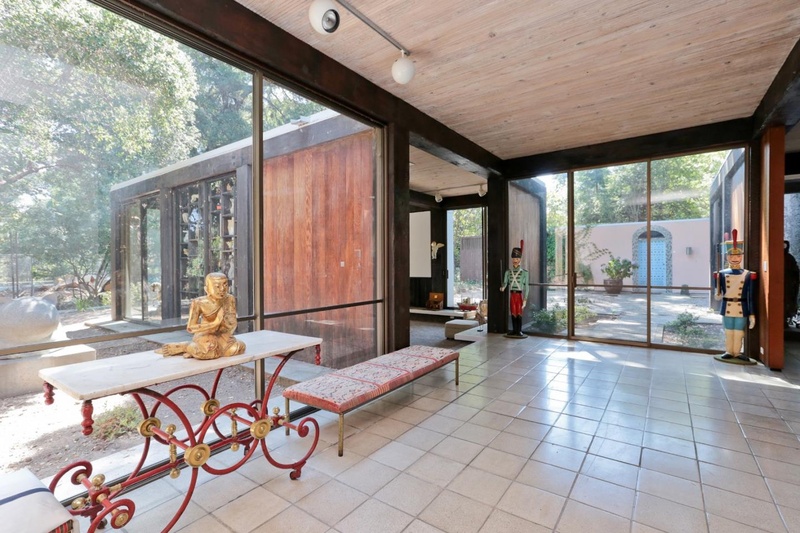 The doors, and everything else in the house, were custom-made for Robert Scoren, who commissioned Mid-Century Modern master Don Knorr and interior designer Alexander Girard to concoct his jaw-dropping dream home, which was completed in 1969. The artistry continues through the entry into a truly one-of-a-kind residence. The original interior design is evident in almost every room of the house, from furniture, to textiles and paint colors. 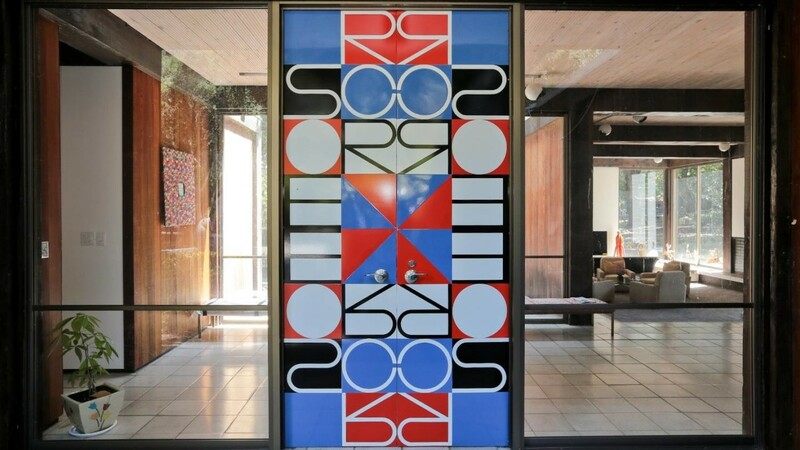 The doors were created by graphics guru Girard, who may be the most famous designer you’ve never heard of. 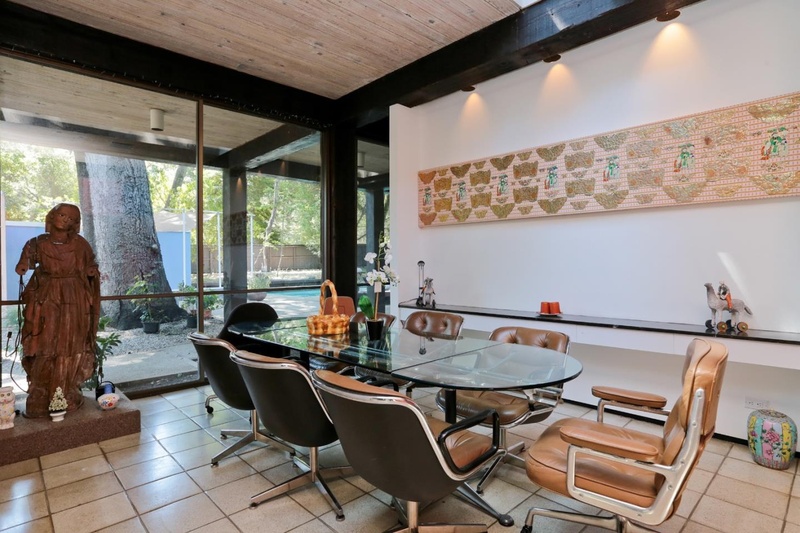 Girard, who died in 1993, collaborated with such notable Mid-Century Modern designers as Charles and Ray Eames, and George Nelson, and created original textiles for the Herman Miller furniture store. Jonathan Adler, the famed decorator with his line of eponymous decor stores, counts Girard as one of his top influences. And if you’ve ever seen the legendary Irwin Miller House in Columbus, IN, built in the 1950s, you’ve already encountered the swoon-worthy Girard “pillowscape” and glorious textiles in the conversation pit that enliven the otherwise stark architecture of the Eero Saarinen–designed home. The home’s new owners agreed to preserve the doors for the Scoren family, which are practically like a cubist family crest. Look closely and you’ll see the initials “RS” for Robert Scoren, who died in 2012. The doors were just passed on to the delighted family, and will be installed at a daughter’s home in Los Angeles.